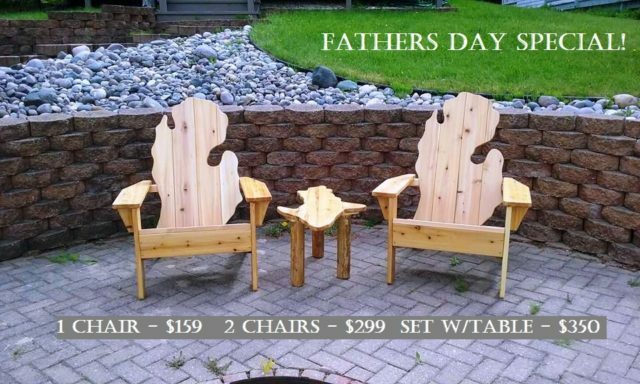 Perfect for Father’s Day! Consider our Michigan chairs and table! Priced to sell, these chairs and tables are made of high quality upper peninsula cedar or pine! Less than even the “wholesalers” are doing, our Michigan chairs and tables will only set you back $350 for a complete set of 3 if you order from now until June 17! Best of all, our chairs and tables are made of all Michigan lumber 100% in Michigan!! In addition, from now until then, all Michiganders get free shipping anywhere in the state! add $50 if you want them finished.